"A delicious no-bake dessert, this is the kind for any occasion that everyone loves and wants the recipe for. Vary crusts using chocolate or vanilla wafers. Garnish with nuts or cherries." Combine graham cracker crumbs and melted margarine, and pat into bottom of 9x13-inch pan. In medium, non-stick saucepan over medium heat, combine remaining margarine, confectioners' sugar, eggs, corn starch and vanilla. Bring to a boil, stirring frequently. Continue stirring, reduce heat and simmer 8 to 10 minutes. Let cool, then spread over crust. 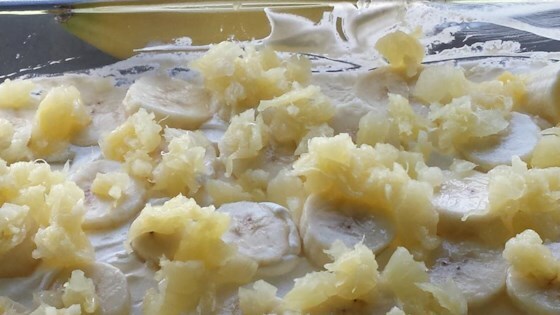 Peel and slice bananas, dipping each piece in lemon juice to prevent browning, and layer over custard mixture. Layer pineapple on top of bananas. Cover all with whipped topping. Keep refrigerated until serving. Sorry to say but the custard did not taste good and had a grainy texture. This was fantastic. I made it two nights in a row.However the second time I just used vanilla pudding instead of making the custard. This was very good. I tried coconut cookies for the crust. It was absolutely amazing and no fuss to make at all.